Published Jan 30, 2017 By Julia 2 CommentsThis post may contain affiliate links. 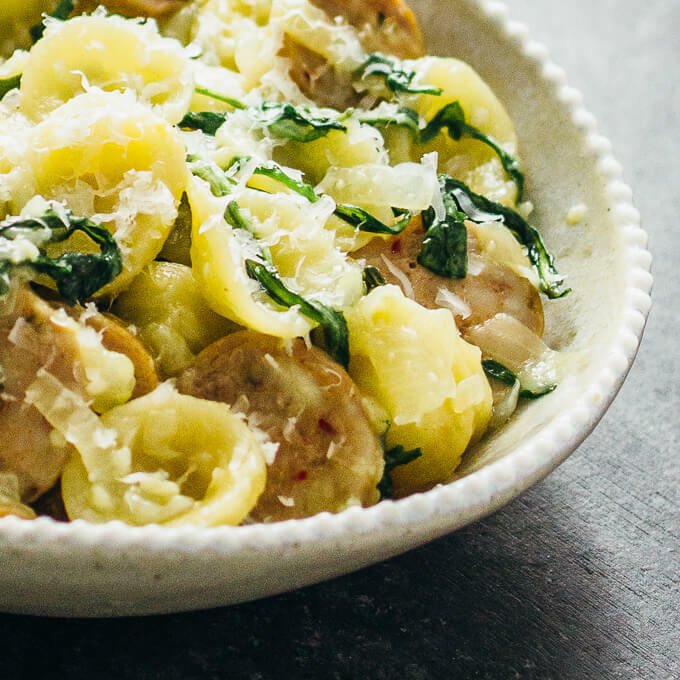 Make your next pasta using orecchiette. 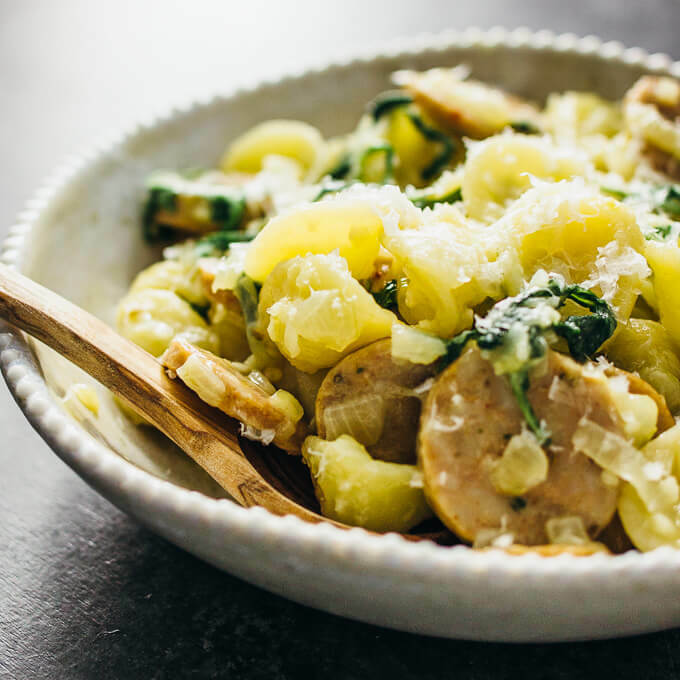 This easy one-pot pasta recipe also includes sautéed onions, sliced sausage, arugula, and finely grated asiago cheese. This dish is what I affectionately call grad student’s pasta: this recipe is easy to make, doesn’t require much kitchen equipment as a one-pot recipe, and is inexpensive. In other words, it’s a perfect match for your local hungry grad student on a budget. Besides, it’ll probably take a grad student in order to figure out how to even pronounce the word orecchiette. Years ago when I was a grad student, these kinds of recipes were a staple in my kitchen; back then I only had a bare minimum of kitchen equipment, very little time for cooking, and a insatiable craving for pasta. This pasta dish has great texture and taste — the texture is smooth and creamy due to the sautéed onions and the chicken broth, and the taste is dominated by garlic, spicy Italian sausage, and grated asiago cheese. It definitely makes for a warm and comforting dinner. You might know that I’m a big fan of garlic. 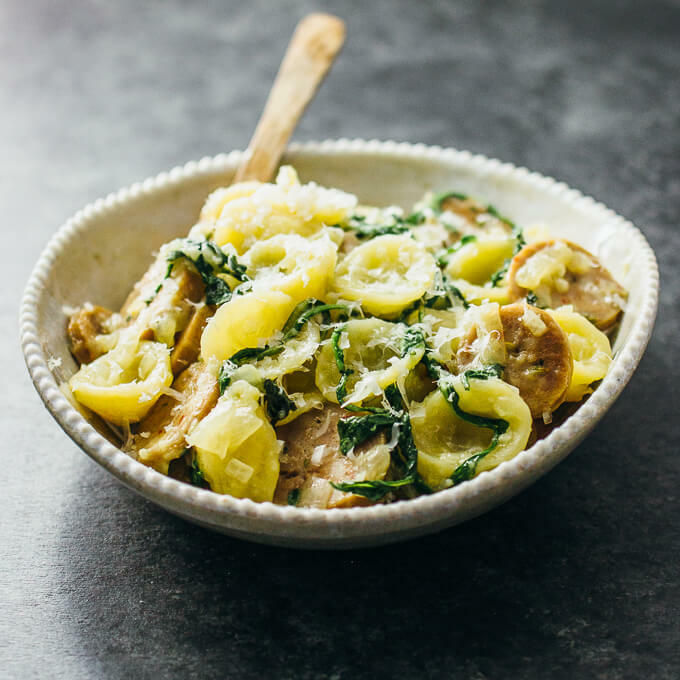 I listed 5 cloves of garlic in the recipe below, but if you’re not most people like me, or you don’t plan on being around people for the next 12 hours, you can put in an entire bulb of garlic as I did. Do it. Heat olive oil in a large pan over medium heat. Add diced onions and garlic. Cook until the onions soften, about 5 minutes. Add chicken broth to the pan. Bring to a boil over high heat and then reduce to medium heat. 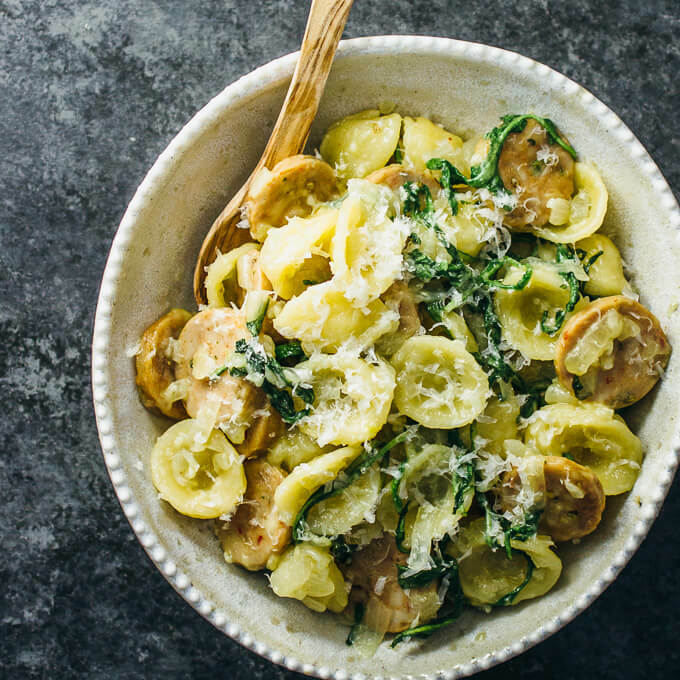 Stir in orecchiette pasta. Add more broth if necessary until the orecchiette is mostly submerged. Let simmer until the orecchiette is tender and the pan is dry, about 15 minutes, stirring occasionally. If the orecchiette hasn't finished cooking but the pan is dry, add more broth. Add salt to taste, if necessary. Reduce heat to medium-low. 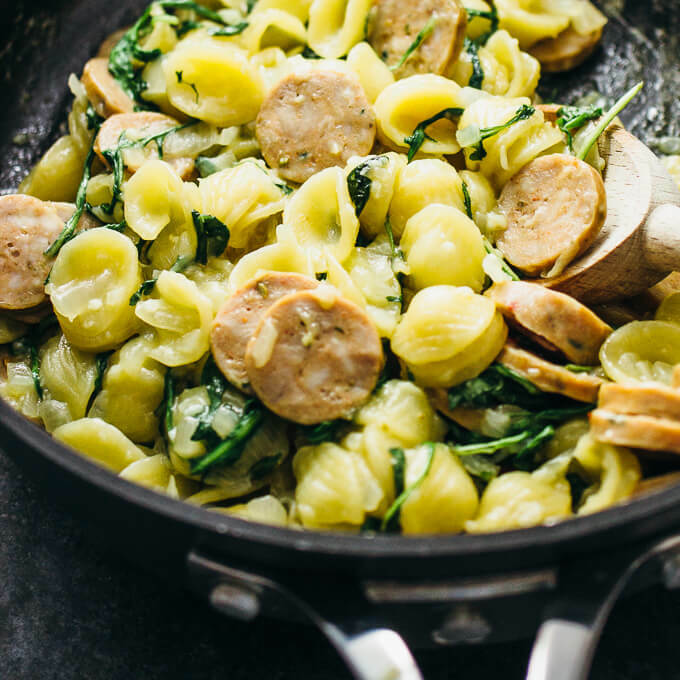 Stir in arugula and sliced sausage, cooking until the arugula wilts and the sausage is hot. Serve in bowls and top with asiago cheese. Sounds wonderful! I like the idea of arugula. I’ve made dishes like this with spinach. I’ll have to try arugula!